This block was our inspiration for our greatest event ever! 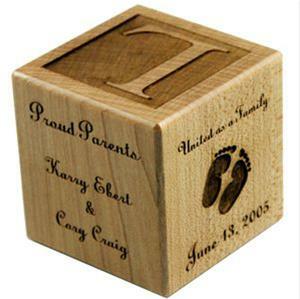 We were asked to convert our baby block over for friends who had internationally adopted. We made the block, put it on the website and noticed quite of few babies were coming to the US from China! We chatted with customers about their experience and VOLA we were submitting our paperwork to meet our daughter. In a whirlwind of events Miss LeeLoo came home about a year and a half later! 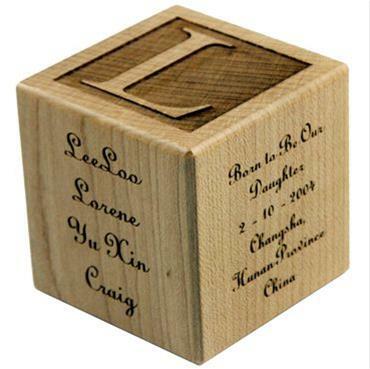 Engraved details include: Child's full name, date of birth, time of birth, weight and length, name of parents, date of adoption and where they were adopted from. We know that international adoptions might not have the stats thus we make the block look it's best with or without the stats.